So my only protection is a kindergarten teacher and a ninety-eight-pound female minister....And they don't even believe I'm in danger. As Bethany approaches her thirteenth birthday, her parents act more oddly than usual. Her mother cries constantly, and her father barely lets Bethany out of his sight. Then one morning he hustles the entire family into the car, drives across several state lines -- and leaves Bethany with an aunt she never knew existed. Bethany has no idea what's going on. She's worried her mom and dad are running from some kind of trouble, but she can't find out because they won't tell her where they are going. before and her parents wont tell her why. her aunt isnt telling her the whole story of her family. eyes, so you figure out whats going on just as Bethany does. Any middle school student will enjoy this timely thriller. Double Identity is a teen fiction book about a 13 year old girl who is confused about what her parents are doing to her. Through out this book she learns about her life. Her name is Bethany and she is left with her aunt, who she has never heard about before. There her parents call her really rarely and talk to her aunt about a girl named Elizabeth. She gets confused about who is Elizabeth. Then she gets to know that Elizabeth was her sister who died when she was 13, and her mother is scared that Bethany will die too because she is 13. Now Bethany thinks that not all the girls die at 13 age, so she gets worried. But then she listens secretly about that she is a clone of Elizabeth meaning that she is going to die the day she did. Read the book to find out about what happens to Bethany. This book is captivating! A true thriller;I was not able to put this book down. The genius behind it, Margret Peterson Haddix, has made multiple books, each of which so suspenceful, you will find yourself on the edge of your seat. Out of all of her books, "Double Identity" has to be my #1 favorite! When a simple girl's suddenly crying mother and disturbed father send her to live with her aunt, things only get stranger. Her whole life, she has been protected by her mother and father, she was home-schooled and was never really opened to the real world. When she gets to her aunts, the mystery of her double identity unfolds, she can never go back to her simple life... Without wondering who is after her, and why. Why did her dad leave her at her aunts? Why won't her mother stop crying? Why is she being followed? Will she ever see her parents again? Find out in this five out of five star, suspenceful, thrilling, shocking novel that you simply can't put down. 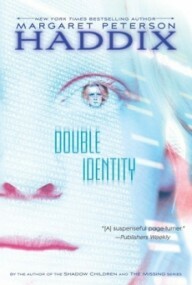 The book Double Identity by Haddix, is not your usualy book. I really hate cliche books and this book is definately far from it. It is about a girl with extremely overprotective and clingy parents. She has never been apart from them. But things suddenly start to change when all of a sudden whenever her mother looks at here she statrts sobbing uncontrolobly. And to make matters worse out of nowhere Bethany's parents decide to place her under the care of an aunt she has never heard of. So many questions start forming in her mind; and more questions start to form when she gets a strange phone call from her mother instead of calling her Bethany she calls her Elizabeth. She acts her aunt many of these questions and only gets one answer. 13 years ago from that one week from that day is the day Bethany's long lost sister Elizebeth died in a car crash. This book is one of the most interestiong books I have ever read and i reccomend it to anybody. When Beth has to go and live with an aunt she didn't know she had, she starts wondering whats going on. Her mother is crying all the time lately, which doesn't make matters any better. Double Identity is a very good book with many twists and turns you don't ever see coming. I have read more than 5 times!